Use OEM quality components to wire your fuel pump or fuel cell project with the CJM Fuel Tank Bulkhead Kit. 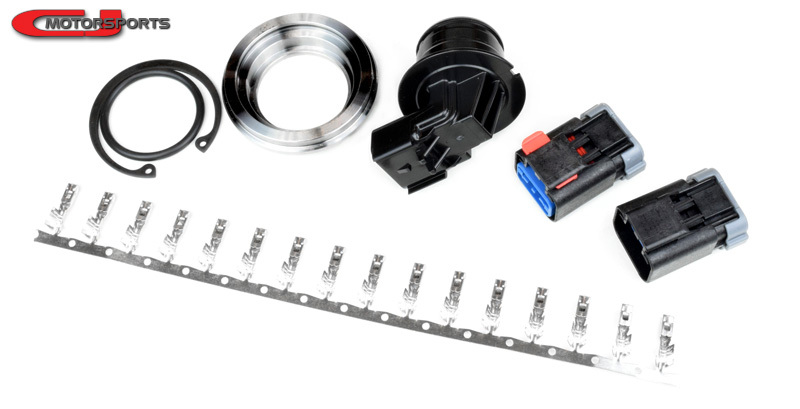 The kit includes a weld-in mild steel bung for the bulkhead connector, a viton o-ring to seal the bulkhead to the bung, and a snap-ring to secure the bulkhead. Internal and external connectors are included, along with 16 crimp terminals (4 spare). The connector kit is rated to 40a. The terminals are intended for use with 14-10AWG wires. A quality barrel crimp tool is highly recommended for crimping the terminals. The terminals are easily installed or de-pinned with ease using basic hand tools. Note: 10 AWG wire, while possible, is difficult to use in this connector. Consider additional spare terminals if you are determined to use 10 AWG. Max diameter of the bung is 2.4". Minimum panel hole diameter is 1.9".